1. Two sides of the triangle. 2. One side and one interior (standard) angle of the triangle. 8.3 Problem 1: Find sin x in the below mentioned figure. sin x = Opposite Side /Hypot. 8.3 Problem 2: In the figure given below, a rocket is fired vertically upwards from its launching pad P. It first rises 40km vertically and then travels 40km at 600 to the vertical. PA represents the first stage of the journey and AB the second. C is a point vertically below B on the horizontal level as P. (!!) The horizontal distance of point C from P.
find the length of the ladder. This angle is called 'Angle of elevation'. (The angle of elevation is the angle made by the object to the horizontal line (could be imaginary in some problems) to the ground, as seen by observer looks up at the object).Hence this angle is formed above the horizontal line. 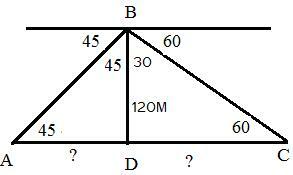 8.3 Problem 4: A kite is attached to a 100m long string. 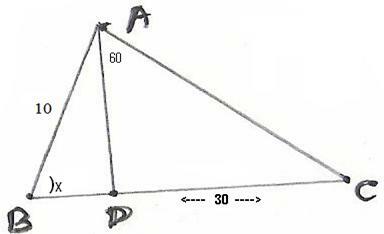 Find the greatest height reached by the kite, when the string makes an angle of 600 (the Angle of elevation)with the level ground. 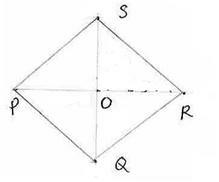 We also know that in rhombus diagonals bisect each other perpendicularly and diagonals bisect the angle at vertex. If one ship is behind the other, find the distance between the two ships. (The angle of depression is the angle made by the imaginary horizontal line to the ground from the top of light house to the ship, as seen by observer sitting in the light house). The angle of depression is the angle made by the observer to the horizontal line (could be imaginary in some problems) to the ground, when observer looks down at the object. Hence this angle is formed below the horizontal line. In the adjoining figure CO can be imagined to be light house of height 150m. B and A are the position of ships. 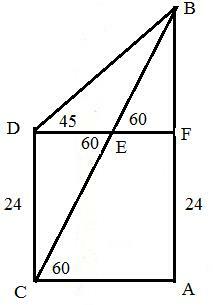 8.3 Problem 8: The angles of elevation of the top of cliff as seen from the top and bottom of a building are 450 and 600 respectively. If the height of the building is 24M, find the height of the cliff. In the figure DB is light house. A and C are positions of 2 ships. =120+ 120* /3= 120+40 .